Born and raised in Cleveland Ohio, Bob Peck began his art career at an early age as an admirer of graffiti art that he saw scattered around his neighborhood on the West Side of town. He always wondered how and why people did it. What did it mean? Did they do it for free? Was it allowed? Years of being a bystander in the subculture went by and Bob continued to draw what he saw in his environment. He began to follow the graffiti "trails" to places with densely marred walls full of this urban art. After repeatedly visiting these places at varying hours, he began to meet some of the local graffiti "writers" of his area. These so-called vandals took Bob under their wing and began teaching him about the history and techniques of the art. As time passed, he began to paint on his own. First in his neighborhood, then around the West Side of Cleveland. Years went by, and Bob Peck had his pseudonym "tagged" all over town. Everywhere he went he left his mark. 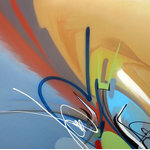 He continued to develop his skills as an artist and a graffiti writer. He was now creating works of art with spray paint cans that rivaled most airbrush artists he saw. As he reached his late teens graffiti had taught him more than just art. It raised him from a boy to a man. It taught him leadership and the spirit of competition. It brought about an ability to network and socialize using these talents society itself deemed as "illegal art". It was time for Bob to take the acquired skills and transcend. He began to work the club circuits, offering his talents out for local dj's and bands. This gained him notoriety and connections. His name was out of the shadows. The art had grown from off the walls to many different mediums. Bob peck considered himself more than just a graffiti writer. He was an artist with a message. He was picked up in the Fall of 2000 by the Rock and Roll Hall of Fame and asked to do presentations regarding graffiti as part of the hiphop culture. Alongside this, Peck was now learning and experimenting with other forms of fine art like abstract and graphic design. Years have passed since and Bob Peck now does work for major corporations, sports teams, clubs, and is still a presenter/ educator for the group Progressive Arts Alliance which spawned from the early Rock Hall presentations. His abstract expressionism pieces can now be seen in galleries across the metropolitan Cleveland area in place of his once tagged name. These pieces still hold the essence of graffiti art and culture inside each one. The pieces are done with his familiar tools of his youth: Spraypaint, markers, and acrylics. From teen graffiti artist to Gallery artist/ educator, Bob Peck still spreads his message and name across the city to this day.